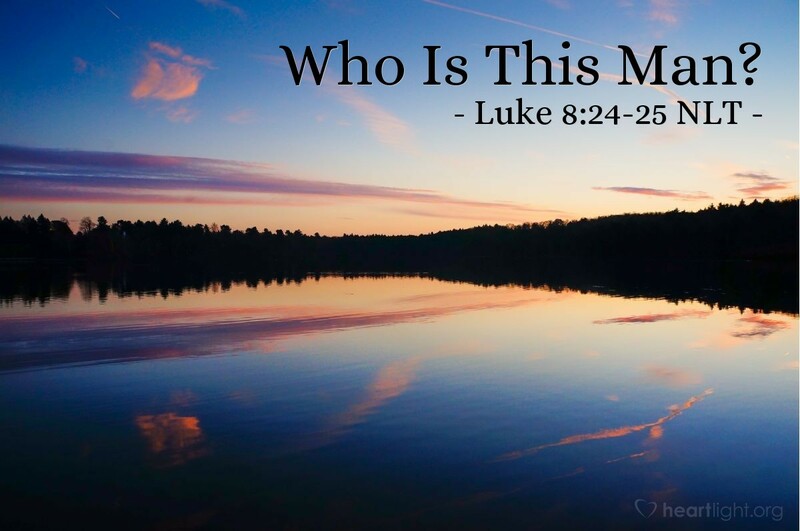 The disciples went and woke [Jesus] up, shouting, "Master, Master, we're going to drown!" When Jesus woke up, he rebuked the wind and the raging waves. Suddenly the storm stopped and all was calm. Then he asked them, "Where is your faith?" The disciples were terrified and amazed. "Who is this man?" they asked each other. "When he gives a command, even the wind and waves obey him!" The question "Who is this man?" answers itself! Only the Creator controls creation. No human can. Only God can bring calm to the storm and bring order out of chaos. This Jesus is more than a man; he is the Creator in human flesh! His words must be met with faith and obedience. His words bring grace, mercy, and peace! Almighty God, the Father of all, I praise you for your creation. I confess that my mind cannot adequately grasp all that it means for Jesus to be fully God and yet to have come in the limitations of human flesh. Nevertheless, I praise you for that grace, and I offer you my life in obedience to your gift. In Jesus' name. Amen.